‘And now for something completely different’, as they used to say on Monty Python. Until now our visits have concentrated on the past and buildings, matters Roman and old castles and historic houses. This visit was concerned with the future and nature. We were off for our first visit to Kielder Water. We’d heard lots about Kielder over the years but had never got around to making the detour off the A69. We set the trusty Sat Nav and followed the route we were told, arriving after an hour or so driving. As we passed several sites at the side of the water we began to be concerned that maybe we’d set the wrong postcode for our destination. However, all was well and we arrived at Kielder Waterside. The helpful lady in the shop/information confirmed we’d come to the place we intended, and we went for our usual coffee and scones. Shock! Horror! No scones! Plenty of nice looking cakes but we don’t do cake in the morning, so we settled for toast. We walked up to ‘The Bike Place’ where Martin was waiting for us with our two electric bikes. Yes, we know, what are two active septuagenarians doing with electric bikes? The answer is having a go with a view to the future. Martin gave us a tour of the controls which are the same as a normal bike with the extra facility to be able to select how much help one wants from the electric motor. One can of course use these machines as an ordinary bike, although it has to be said they are rather heavy, and if you don’t pedal you don’t get any assistance. It does seem a bit odd to begin with but very quickly you get used to it and can start to enjoy the ride. We went around a pathway in the trees and sailed up inclines that would have seen us getting off and pushing a standard bike. Next a trip round the side of the reservoir out in the open and covering considerably more distance than without the electric bike. I have to confess that I’m hooked on these bikes now, although it still feels like cheating, but it does mean one can cover much greater distances, ride up hills that would make one suffer, keep up with younger and fitter riders. All this without getting hot and sweaty, and one can really enjoy the views. Reluctantly we gave our bikes back and went for our appointment with Milly to find out about The Ospreys. There are telescopes set up to see a nest across the water but at in excess of two miles there is not too much to see, however there is a camera set up on the nest and a live feed into a hut where one can see the actual nest itself. The nest is built on a man-made platform that is the size of a double bed. Milly is extremely knowledgeable on all things osprey and told us more things than our old minds can remember but we’ll try to relate what we can remember. Osprey’s favourite food is trout but they will also fly to the coast on occasion and catch sea fish, regrettably we didn’t see any diving for fish. Apparently, ospreys can rotate their rear talons so that they can carry caught fish like a torpedo in order to reduce wind resistance. Additionally, their eyes are adapted to allow for refraction so that when they dive they see the fish where they are, not where our eyes would think they are, nature surely is an incredible thing. There are other nests in Kielder with chicks, and it is a success story that so many are returning each year to breed. We were amazed to be told that the parents leave the nest before the chicks and leave them to make their own way to Africa. Also, the parent birds spend the winter apart and fly separately back to Kielder but they arrive within days of each other. How do they do that, we can’t arrive for coffee at the same time if we separate in Morpeth? The chicks stay in Africa until they are ready to breed but hopefully they will return to Kielder for many years to come. 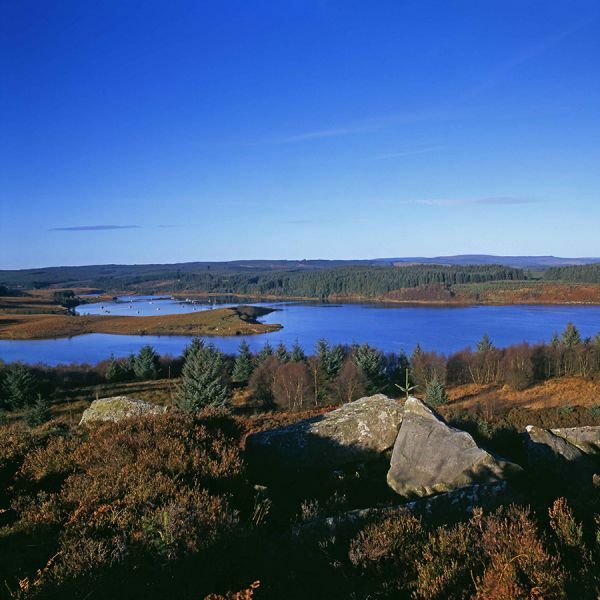 Speaking of returning to Kielder, one visit is nowhere near enough so we will be returning to Kielder to see much more. We returned home via a different route, not by choice but due to misunderstanding the sat nav, but hey it was nice to see somewhere different. With views of the reservoir Kielder Waterside is the ideal base to recharge and refresh or take part in an action packed day of activities. The Boat Inn Restaurant and bar serves fresh new locally sourced menus throughout the day. Visit one of the largest and most fascinating collections of birds of prey in the North of England, located within the magnificent forest lakeside surrounding Kielder Water.